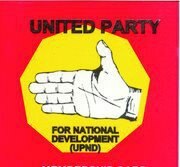 Opposition United Party for National Development on the Copperbelt says FDD leader Edith Nawakwi has lost her political relevance as evidenced by her support for the violent Patriotic Front. Party Provincial Chairperson Elisha Matambo said Nawakwi has lost political direction and could not rightfully tell wrong or right. Matambo said Nawakwi had no morals to suggest the banning of UPND from participating in elections and should keep quite from launching unfounded attacks on UPND President Hakainde Hichilema who is far above her political level. “Nawakwi is now a job seeker who was eyeing the position of running-mate in the Patriotic Front after Her Honor Inonge Wina had left and this is the reason she had started writing “Love Letters” to President Edgar Lungu and the PF. I am advising Nawakwi to stop deceiving and misleading the Zambian people who were aware of the PF violence in the country. Nawakwi has no heart and does not care about the Zambians who have been subjected to abject poverty by the PF government,” said Matambo. He added that it was unfortunate that Nawakwi could declare the PF as a non-violent party with all atrocities they have committed against Zambians. Matambo said Nawakwi need to introspect and tell Zambians the truth about political violence in the country. He said as a mother, Nawakwi was expected to expose the PF political violence and not tell lies about things which were in public domain. “If Nawakwi was honest with her assertions against UPND why did she avoid commenting on the failure by the police to arrest the six PF thugs who were found in possession of machets and guns in Sesheke? On Nawakwi’s celebration of the UPND Lusaka Province chairman Obvious Mwaliteta’s arrest, I wish to educate her that Hon. Mwaliteta is Innocent until proven guilty by the courts of law and not herself,” he said.